UMD has been made famous on broadcasts for two things this season: the number of times the Bulldogs have played the #1 team in the nation and that UMD has the hardest strength of schedule (SOS). The SOS has been on full display this month playing games in Canada (these don't count, but it is a travel series that counts ), at North Dakota, against a physical and surging Western Michigan, UMTC Gophers, and now at Denver. It will be a five weekend sprint to the finish of the NCHC regular season that includes one non-confernce opponent series. But don't think that the schedule will let up either. On the schedule is still Omaha, at Miami, and at Western Michigan who was a tough opponent for UMD. SOS will help with PairWise, but in the end UMD will have to win to make the Tournament and play through March and into April. Road, Sweet Road. For the second season in a row, the Bulldogs are a better road team than at home. This season the numbers are 8-3-0 on the road and 5-4-1 at home. What is it that is better on the road? Jokingly some have said that the concrete is still settling at AMSOIL Arena (like some have said about the first couple years at Target Field and the Twins). If it is that the team is easily distractible, that is OK, right? The games that matter at the end are on the road. But no, they are neutral sites, where UMD is 1-2-0 this season. This road thing is a real head scratcher. Playing with the Lead. UMD is a strong team when taking a lead into an intermission. 8-1-0 is the record when the Bulldogs lead after the first and an impressive 11-0-0 after the second. That perfect record after two periods was in dire straights last Saturday after allowing a tying goal early in the third against the Gophers. What mad it more perilous was UMD only logged two shots on goal that third period. One was the goal and the other was a weak dump-in that found its way on goal. Counter that with this weekend's opponent, Denver, is equally good with the lead going into intermission. They are 6-1-0 when leading after the first and and identical 11-0-0 after two. Picks by @afiskness. Last weekends Bulldog hockey games were not what any fan was looking for from this team. UMD managed to get a win against the Gophers, but probably should have gone home winless. Now the question is what UMD team will show up this week? #7 Minnesota Duluth @ #11 Denver: I am conflicted between the sky is falling for UMD and if they turned things around by beating the Gophers. I guess that means a split. #2 North Dakota @ #3 Nebraska Omaha: This is the probably best series in all of hockey this weekend. I can't see one team dominating it, so it will be a split. St. Cloud State @ Colorado College: This might be the weekend that both teams turn the corner, or then again it could be more of the same. I will go with the latter. Split. #8 Miami @ Western Michigan (1 game): Miami need this win more and they will get it. The Redhawks get the win. It goes to show what predictions, polls and PairWise know. And it is a good reminder of what a single elimination tournament can do as we move closer to conference tournaments and the NCAA Tournament. UMD bounced back nicely and salvaged the weekend with a win Saturday afternoon over the Gophers 2-1 after bowing to BSU Friday 4-0. This is getting close if not in the wheelhouse of "must win" for both teams. The Gophers are trying to turn a slipping season around and salvage the possibility of an at-large NCAA bid. The Bulldogs are trying to regain their confidence as a hockey team, period. My prediction then would be a tie. Fitting, right? Championship. BSU and MSUM will meet and the winner will be the second team to win the North Star College Cup. After watching the semifinal games I was asked to predict the score assuming the winner was a foregone conclusion, that being the Mavericks. I answered 7-1, so I will go with that and MSUM the winner. Although BSU can be a little tricky as UMD found out…but MSUM won't let that happen. Day 2 NSCC. Focus on that because the game today at the Xcel Energy Center was dreadful. It is not usual to be writing before letting the weekend play out, but it is a new opponent tomorrow and we are getting to the point where each game is the next shovelful in the hole that is being dug by the Bulldogs. PWR is the focus of the comments after a lackluster UMD performance where they were shutout by the Beavers of BSU 4-0. The numbers now show that the NCHC would have five of their eight member schools in the NCAA Tournament. That is not going to happen. The result is that teams that want to stay in contention need to win. Duh, right? But that is a huge struggle right now for UMD let alone scoring a goal. The confidence is gone and it shows in the play on the ice. It is amazing and startling to see the Bulldogs play today compared to the Bulldogs of November/December…unrecognizable. Most telling of all is the lackluster power play. Against BSU, the Bulldogs had 12:07 of power play of which 0:33 was 5x3. During the power plays, UMD amassed no goals and only six shots. Good puck movement at times, but the shots and goals are just not coming. I don’t know what it will take to stop the tailspin, but it has to happen soon as we approach February. And judging from the UMTC versus MSUM game going on right now, the level of opponent play tomorrow in the consolation game will not let up. Bad taste in the mouth is an over used cliche, but what else can you say after last weekend's games against WMU? The best way to get that out of the system is to win and maybe no better opponent to get a win than against Bemidji State. BSU has had a rough year and they may be talented, but this is a team the the Bulldogs should take care of in fairly easy fashion tonight. Then the Saturday opponent can be planned for. Images via Wikipedia: Bulldog, NCAA, Beaver. Picks by @afiskness. The results of last weekends UMD hockeys games shows how tight the run for the Julie and Spencer Penrose Memorial Cup. The Bulldogs are currently experiencing the same issues that they have experienced the the last few season: defensives turnovers, susceptible goaltending and lackluster effort at home. These issues have to be remedied if this club wants to play late into March and April. #11 Denver @ #9 Miami: These are two teams that are evenly matched. The Redhawks are a much better home team then road and they should have the advantage. I will go with a split. Colorado College @ #2 North Dakota: Last week the Tigers found a nice win last weekend, but thing will be different in Grand Forks this weekend. North Dakota sweep. Western Michigan @ St Cloud State: The Broncos are playing really good hockey, but now the Huskies have found some magic. This should be a good series that will end in a split. 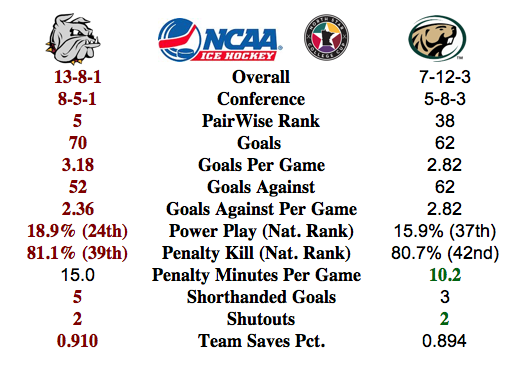 #7 UMD vs Bemidji State: The Beavers slow down play will likely be tough for the Bulldogs. I think the Bulldogs are a good enough team on the road to get a win to advance to the Championship game. UMD fan should cheer for the Mavericks as that would be the better team to play in the PairWise Rankings. The past weekend being described as frustrating is an understatement. 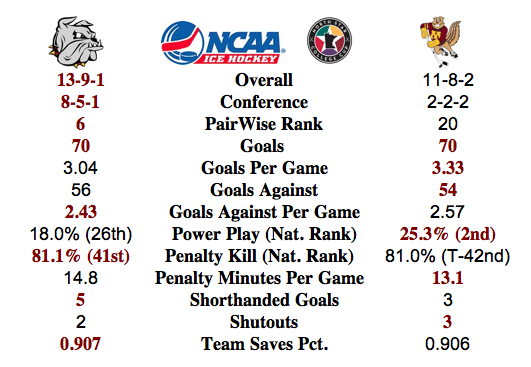 One point out of a possible six for the Bulldogs has taken control away from UMD in the NCHC regular season race. The Bulldogs are still second in the conference just as when they entered the weekend, but third (North Dakota) and fourth (Miami) now have two conference games-in-hand. What is most striking from the weekend is how the Broncos used size and defensive minded pay to take the Bulldogs off their game and keep scoring at a premium. That is not to say that UMD did not have their chances. UMD had some good scoring chances in tight both nights but had problems finishing the play. The difference maker was that UMD faced a goaltender that was up to the task along with some untimely misses. It was fairly apparent UMD has more skilled scorers along with more speed that the Broncos, but WMU still had the best of the games. The more I watched the Broncos dictate play and keep a tight lid on space and time for the Bulldogs, the more I am reminded of a team in green, Bemidji State. BSU has seemingly had a way to do the same tight checking (maybe even clutch-and-grab) style has given Sandelin coached teams fits. And it really makes for boring hockey to watch. But as said this past weekend and years earlier with BSU, you make the team based on what you get in recruiting. And a slow-it-down, grind-it-out style is what the Bulldogs need to be wary of as the season progresses. There is not time to wait as this weekend's North Star College Cup brings the green Bemidji State team in as UMD's first opponent Friday at 4pm. PairWise Commentary. It is after the calendar turned so talking PWR is alright, I believe. So why talk about it? It does have bearing, especially if the team is not winning. Winning makes PWR watching easy if not ignorable, it is when winning takes a break. And this weekend is not time to take a break from winning. After another test, of sorts, against Bemidji State Friday, the second game could bring on the #1 rated Minnesota State - Mankato or highly regarded (nationally at least) UMTC. The Cup? That would be nice. Wins are the highest prize this upcoming weekend. January is notorious for feeling like a long month coming off of vacation days and holidays close to each other in December leading into January 1. But this January is longer than usual for college hockey teams like UMD with five weekends in the month and the team playing a pair of games in each of them. And it is not just the run-of-the-mill middling teams for the most part. A series at North Dakota (currently #7 in PairWise), a game against UMTC (Tied #11) or MSU-Mankato (#1) in the North Star College Cup, and a series at Denver (#14) are the highlights of the month. In the shuffle is a home series against Western Michigan and the opening game of the North Star College Cup against Bemidji State. The weekend sweep of an exhibition series at Thunder Bay's Lakehead University was a good start to a grueling schedule in January. All players will need to be on call for duty at any time as the wear and tear on the student athletes from playing and recent outbreaks of influenza and other viruses could sideline any player. It will be a telling run for the playoff and possibly an NCHC title run when January ends. Half of Season in the Rearview Mirror. The holiday break also brought the mid point of the regular season schedule for the Bulldogs. In a quick summary, goaltending by Kasimir Kaskisuo, offense from Dom Toninato, defense from Andy Welinski, and rookie play from Karson Kuhlman have garnered our high attention at the halfway point for the season. Picks by @afiskness. The second half of the NCHC season begins this weekend. The Bulldogs are tied for first and they would like to take home the Julie and Spencer Penrose Memorial Cup for winning the regular season. This will be quite a feat as I think any of the top five teams could win it. A good showing in Grand Forks by the Bulldogs is a must. 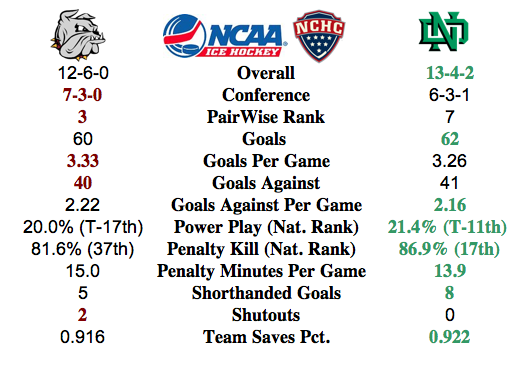 #3 Minnesota Duluth @ #7 North Dakota: The Bulldogs play another #1 team! The toughest schedule in the country continues for UMD. It is always hard to win in Grand Forks, but the Bulldogs do play good on the road. Split. 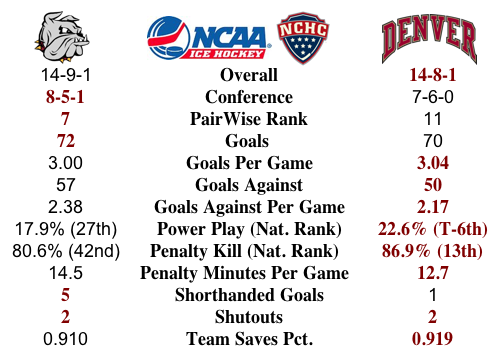 #14 Denver @ #6 Nebraska Omaha: This series will come down to goaltending. Both teams are highly rated and evenly matched. Split. #4 Miami @ St Cloud State: It hasn't been the season that Huskies fan thought it would be, but they do have some quality wins. The large home ice win be an advantage against the Redhawks. St Cloud will get a win for the split. Notre Dame vs. Western Michigan (home/home series): The Fighting Irish (receiving votes) have not played to their expectations this year, but with some success they could be a factor in Hockey East and the NCAAs. The Broncos are in the bottom half of the NCHC standings and are hoping to find some more consistency. This home and home series should be a split.